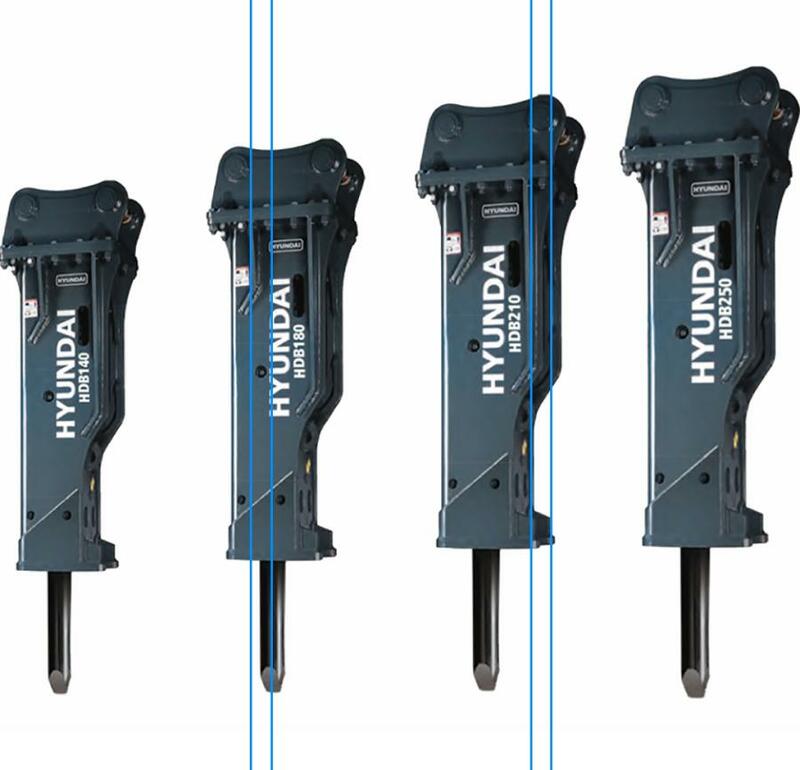 The four mid-sized models in the Hyundai HDB series of hydraulic breakers are designed for use on excavators in the 14- to 25-ton (12.7 to 22.6 t) range. The HDB series of hydraulic breakers from Hyundai Construction Equipment Americas Inc. includes 14 different models to fit multiple machine sizes and applications. Hyundai breakers have a large chisel diameter, which increases the strength and durability of the chisel. Four chisel options are available. Hyundai small breakers are suited to fit compact excavators ranging from 1.7 to 8 tons (1.5 to 7.2 t). Midsized HDB breakers are designed to fit excavators ranging from 14 to 25 tons (12.7 to 22.6 t). Large model HDB breakers fit excavators ranging from 30 to 80 tons (27 to 72.5 t). For use on a Hyundai excavator, standard equipped mounting brackets match up perfectly with the Hyundai linkage. When used on other excavator brands, Hyundai dealers can fit custom mounting brackets for any machine.